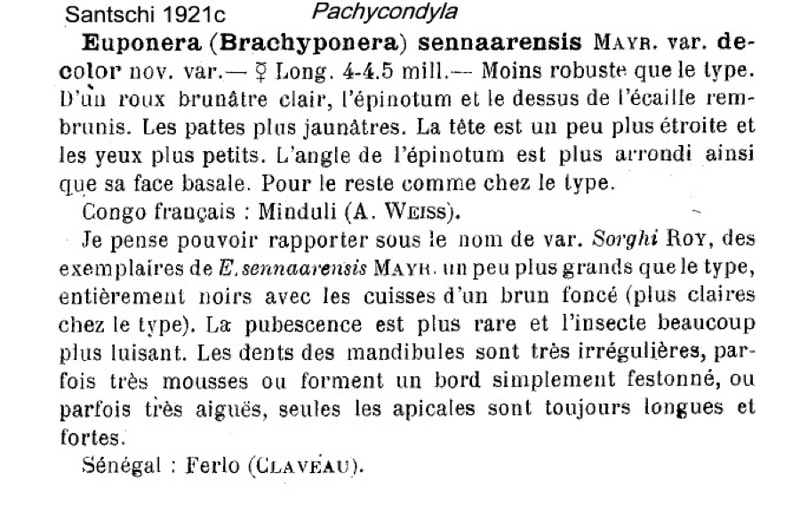 Type location Senegal (Euponera (Brachyponera) sennaarensis Mayr var. decolor nov. var., Santschi, 1921c: 114, worker) from Senegal, at Ferlo, by Claveau . Santschi's (1921c) description of decolor is at . 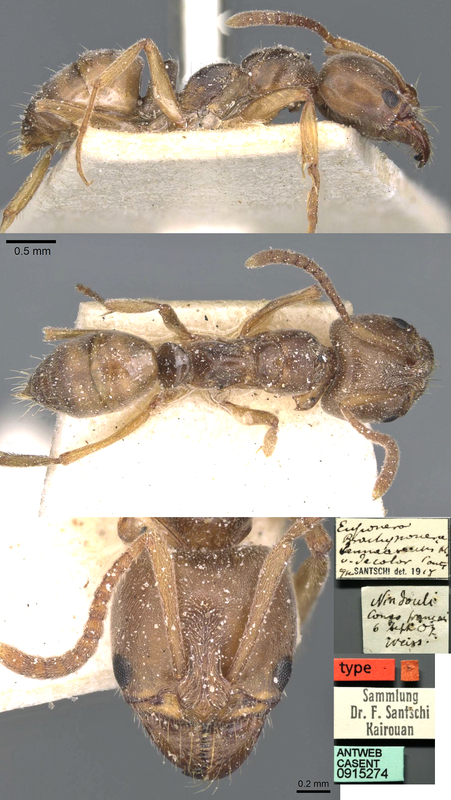 The photomontage of the holotype worker is collated from http://www.antweb.org/specimen.do?name=casent0915275. TL 4-4.5 mm; overall more slender than the type Pachycondyla (Brachyponera) sennaarensis; in full face view this has the head with more convex sides and a deeper occipital impression; the mandibles are unsculptured apart from sparse setal insertions; the pronotal dorsum is flat and more obviously bordered; the pubescence is finer and denser; variable brown to brown-orange. The photomontage is of workers from Gabon, Pongara National Park; collector Yves Braet (Gabon 113). The photomontage is of specimens collected in Cameroun - south-western tropical coastal forest area between Ed閍 and Campo (McKey Wolbachia project, Cameroon 108 ).